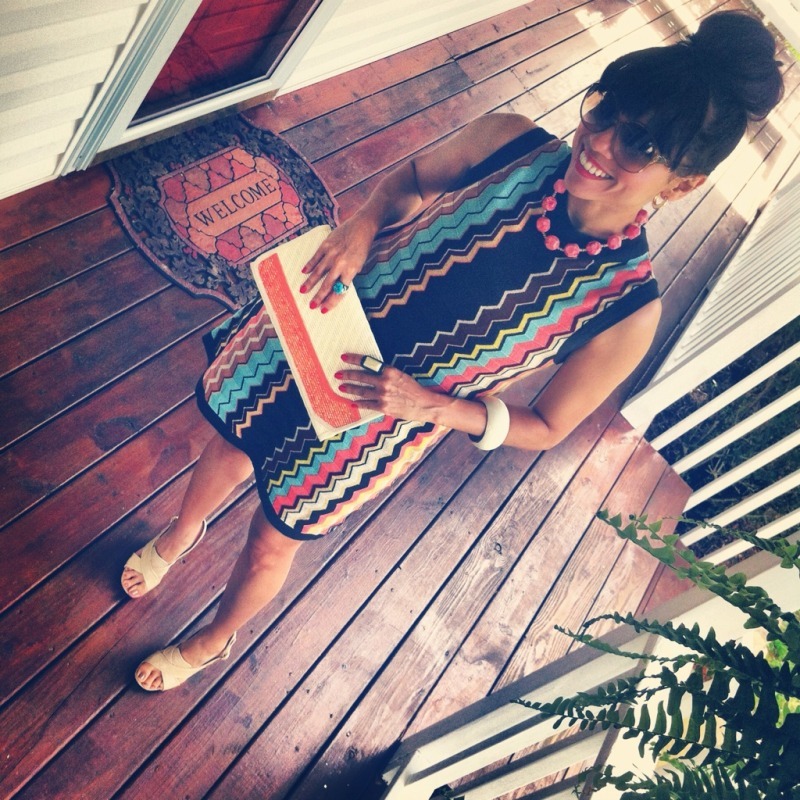 Earlier in the Spring I posted this Missoni for Target dress which I really LOVE. It was money well spent since I've been wearing it often throughout the year. This week I wore it with an adorable and affordable Kenneth Cole swing jacket that I found while I was in Grand Rapids, MI a couple weeks ago. It is from Urban Exchange, a consignment store very popular in that area, but in fact my significant other was the one that found it and as soon he showed it to me...I knew I had to get it. I sent it to the dry-clean and voila!! ... like brand new. I previously posted pictures wearing (here). I know a find like this is not a big deal to many, but for me it is. Since I have a tight budget this is the type of item that keeps my wardrobe alive. Al principio de esta primavera yo cargé en este blog fotos de un vestido de Missoni/Target el cual adoro. Fué dinero bién gastado, porque yo me he puesto este vestido muchas veces durante todo este año. Esta semana me lo puse con una chaqueta de corte princesa que la encontré en una tienda de segunda Urban Exchange en Grand Rapids, MI cuando estuve por allá hace dos semanas. Mi adorado tormento fué el que me la enseñó y tan pronto la ví...sabía que la tenía que comprar. Luego la mandé a limpiar a la tintoreria y voila!!! como nueva. Yo se que compras baratitas como estas no son la gran cosa para muchas chicas , pero para mi lo son. Yo tengo un presupuesto apretadito y estas son el tipo de compras que mantienen mi armario vivito y coleando. And this is how I wore the dress most of the times in spring/summer. Y así es como yo llevé el vestido durante la primavera y verano. Is there anything that you don't wear we'll? Oh I love finds like that.